Over the last year I have taken part in an art doll round robin through Wildart Dolls, a yahoo group. I have just finished the last doll and it will be on its way home this afternoon. 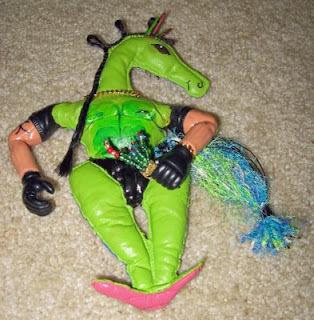 The doll I completed is Dave the horse, who has traveled the world (really...Japan, England) and much of the U.S looking for babes. He arrived at my house without a tail, so I added one...I'm sure that will help with the babe-thing. I also gave him a little bouquet of beaded flowers to take home to his mom, Gail in North Carolina. Happy trails, Dave. I have not been in the studio much since our move. We are actually staying with my parents until employment happens. We are grateful for a place to stay while on this search but it does mean limited access to my studio stash and not much space to spread out and work. I've been trying to find interesting sites and images to share and there are soooo many on the various blogs I've been scouting. Today though, it is hot and I thought you might like to drink in the image of a piece I made a few years ago called Water. Her skirt is made from hand-dyed cotton covered cord that a wire was inserted into so the cords would hold their shape. 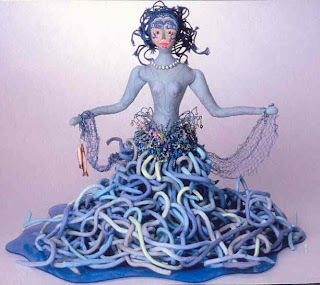 Her net was constructed by stitching on Solvy with cool colored threads and she sports some freshwater pearls and a fish. She stands on a piece of blue glass so it appears as if she is emerging from the water. I hope you stay cool today. This past Saturday I went to the Stone Arch Festival of the Arts in Minneapolis. It was hot, but I loved it. I have gone to so many festivals in Virginia, but moving to a new place means seeing new art and meeting new artists. 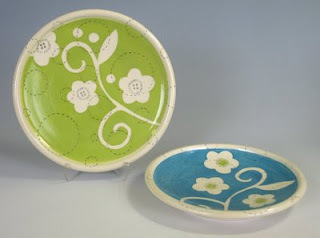 One of my favorites was ceramic artist Emily Dyer. 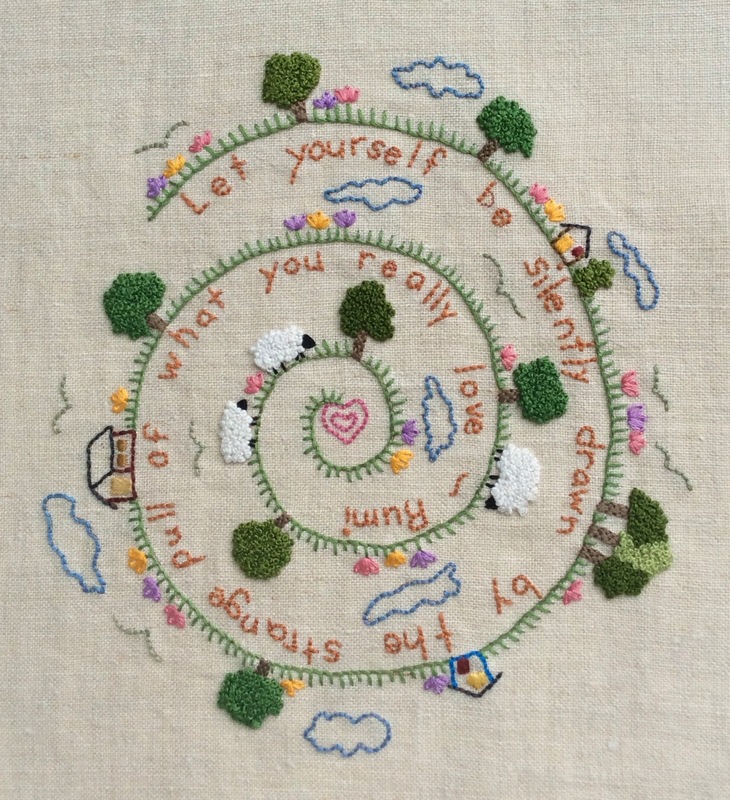 Her family owns a quilt shop and she has spent time working there and quilting herself. 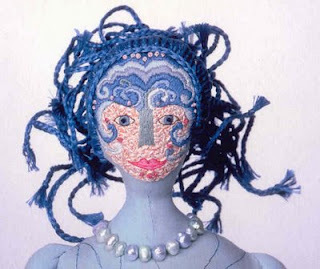 You can see the textile influence in her work. I love the simplicity of it. You can also check out her blog here. On Tuesday I was listening to Here on Earth a show on my local Public Radio station. 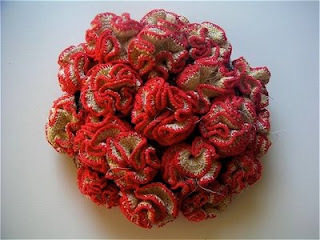 The guest was Margaret Wertheim a mathematical scholar from Australia who has studied hyperbolic geometry and, along with others, has been crocheting examples of hyperbolic space. I must say here, that I am pretty much a math-phobic person, but this was so interesting I went and checked out the websitewith her work, the Institute For Figuring and its galleries. Margaret and her sister Christine are involved in crocheting the coral reef. They have gotten the help of many, many crocheters around the world. The site contains a lot of images of the crocheting and if you are a mathematician at heart it also has a lot of information about the geometry and theory of hyperbolic space (which I actually read and understood). I recently took advantage of a local trail, which is great for hiking, biking and in the winter, cross-country skiing. It runs along the Red Cedar River and is beautiful. One of the first things I saw as we passed under a bridge were these swallow nests which had been built on the side of the bridge. This photo captured one of the birds ready to land in his house...I love the other birds in the nests peeking out. I also came upon these cow parsnips that were just opening up. 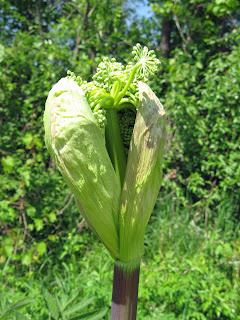 I have seen them in full bloom before but not in this state. The plants almost had a pre-historic look to them. When I go out in nature I am always looking at the repetition and structure of what I see because it often informs the way I create a doll, an image or a pattern. I have become a member of a new Yahoo! group called Decidedly Different Dolls. 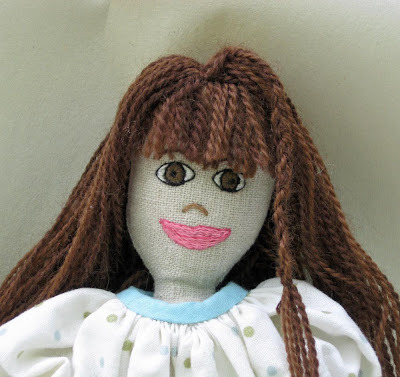 It is a small but growing group open to all lovers of offbeat art dolls. There is talk of swaps, challenges and ideas and support galore. I have known the host and her assistant for almost a year now and if you join I think you will find it to be a lively informative group. A current thread of conversation is making a doll using mainly wire. There are so many different ways of working with wire and so many kinds of wire to work with. I have had a fair amount of experience crocheting and sewing with fairly thin wire. It can be put in a needle and sewed through fabric or crocheted just like you would use yarn or thread. In this photo the piece has legs that are crocheted from a thin wire I got at a beading store. I believe the size was 27 or 28. Prior to crocheting, I beaded the wire and pulled up a bead about every seven stitches. If you click on the photo you can get a larger image and get a better look at her legs. You might think that it would be hard to work with or have a feel that would be unpleasant to have in your hand, but I didn't find that to be true. It was quite pleasant to the touch and made for a very interesting fabric. I'm wondering, what are your experiences with wire? How have you used it in your creations? What worked, what didn't? I'd love to know. 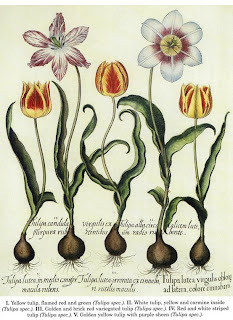 textile artist, I think all kinds of art can be informative. I find the detail in this piece inspirational. Finish everyday and be done with it. be encumbered with your old nonsense. I am a believer in fate and signs...even though I had already read it,I bought the book. I must have missed something important on the first reading. I was perusing my favorite blogs the other day and came upon this great tutorial at the adventures of bluegirlxo. Julie has a great blog and I think this would make a great summer project, especially if you have any tweens to entertain this summer. 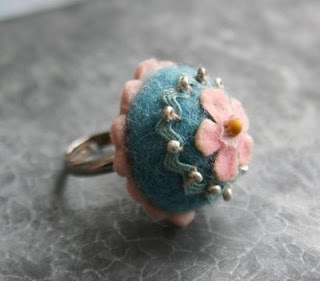 Go here to see how to make your own felt rings. She has quite a few samples for ideas to stimulate your own creativity. 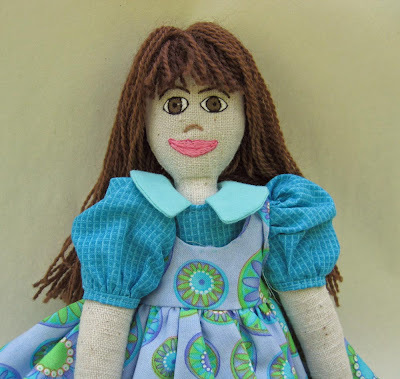 This is the other doll I made from the Edith Flack Ackley pattern. Her name is Jenny and she is a bit more of a tomboy, wearing jeans and a smock top. She is also listed in my etsy shop. 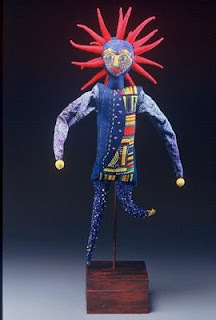 A few months ago I posted about the doll I made from the 1938 book Making Dolls for Fun and Profit by Edith Flack Ackley. Well, I have tweaked the pattern to make it easier for construction and designed a face that is really sweet. I have made two and just posted the first one on my etsy site. (The second one will come in the next few days because I have to redo the photos). I think she is really cute and there are several photos of her, so check her out. Congratulations to Retired Mama! In a totally random drawing she was the winner! 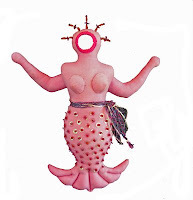 I'll be sending the pink mermaid off to her as soon as I have the address in hand. Thanks to everyone who left comments. I'll be checking out all of your blogs, I know there is a lot of interesting stuff out there. If you were not the winner, please go to my etsy site where I have an equally cool, but blue, mermaid listed.